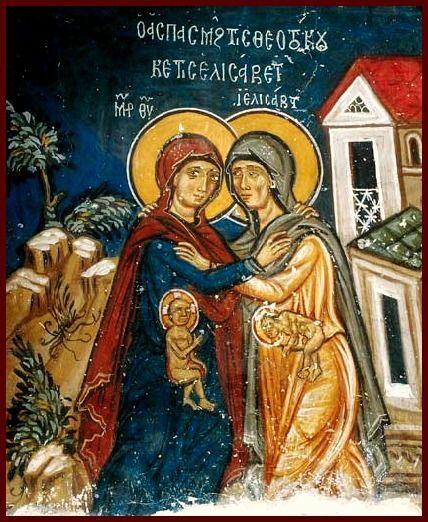 The establishment of this Feast of the Visitation of the Most Holy Theotokos and Saint Elizabeth and the composition of the Service are the work of Archimandrite Antonin Kapustin (1817–1894), head of the Russian Orthodox Mission in Jerusalem. 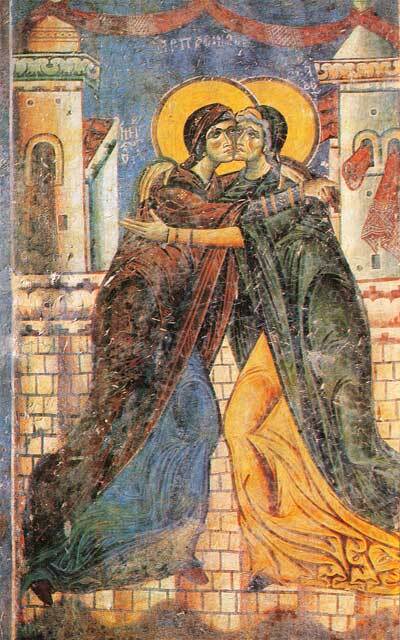 Celebration of the Feast of the Visitation has not yet been accepted by all Orthodox jurisdictions. Kato Amiantos village near Saittas, Cyprus. The unborn John the Baptist bows before Jesus, who blesses him. The Gorneye Convent in Jerusalem, built on the site of the Meeting of the Theotokos and Saint Elizabeth, celebrates this Feast on March 30. Since after the Annunciation (March 25) Mary "went with haste" to visit her cousin Elizabeth, March 30 seems a reasonable date for the feast, but it does run into possible conflicts with Holy Week and Easter. Therefore, if March 30 should fall between Lazarus Saturday and Easter, the Feast is transferred to Bright Friday.